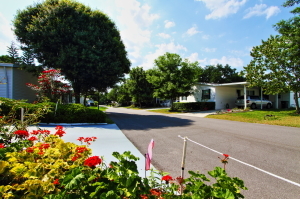 The mobile homes for sale at Hyde Park in Central Florida come in a variety of sizes and floor plans, but the characteristic they all have in common is that they’re highly affordable. We always have an excellent selection of moderately priced one-story homes for sale inside of our community, a development near Orlando that gives adults 55 and older the opportunity to stretch their retirement nest eggs to the fullest in an age-restricted setting with lots of excellent amenities. In fact, Hyde Park isn’t just a place to live … it’s a lifestyle. Buying a home here means joining a community full of friendly, outgoing neighbors who all wish to lead an active retirement lifestyle. We have a spacious community clubhouse that makes it especially easy for our residents to stay active and have fun together whenever they like, seven days a week. Plus, Hyde Park has an excellent location in peaceful Winter Garden, which is only minutes away by car from downtown Orlando, FL. Our residents benefit from having a wide array of attractions right in their backyard. Instead of being isolated like some 55+ communities in FL, Hyde Park is next to a major metropolitan area boasting a multitude of attractions like theme parks, performing arts venues, museums, golf courses, open spaces, and more. For more information about Hyde Park and our current selection of mobile homes for sale in Central FL, contact our Lifestyle Team today.